From big tires to tonneau covers to nerf guards, there are an almost limitless number of ways to improve the functionality and style of your SUV or truck. One of the best ways to add something special to your truck is to get a grille guard or bull bar! At Safari Truck & SUV Accessories in Jacksonville, we have a ton of guard options that you will love to see on your SUV or truck. If you have been searching for ways to protect your truck, grille guards are a great place to start and a spray-on bed liner from Line-X is another excellent option that will pay for itself many times over. 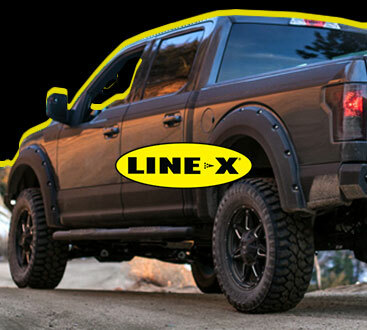 As authorized Line-X installers and dealers, we can help coat the bed of your truck with the special Line-X formula that forms a perfect, nearly indestructible, bond that is both tough and stylish. Call us today for a free quote on grille guards, bed liners, nerf bars, and many other truck accessories. 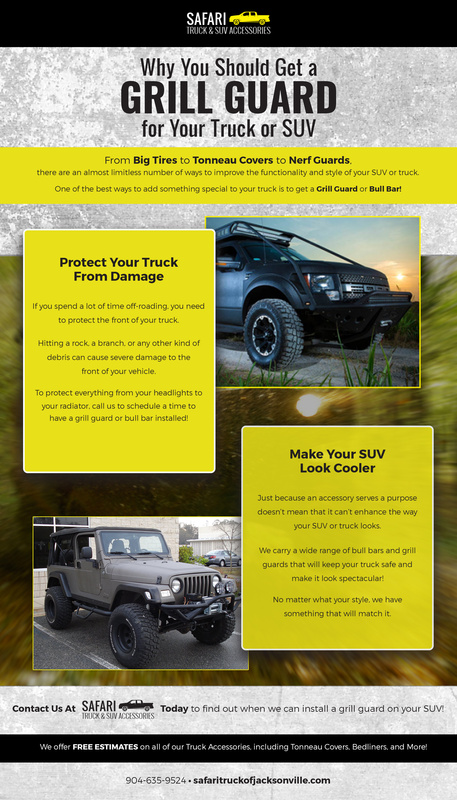 If you spend a lot of time off-roading, you need to protect the front of your truck. Hitting a rock, a branch, or any other kind of debris, can cause severe damage to the front of your vehicle. To protect everything from your headlights to your radiator, call us to schedule a time to have a grille guard or bull bar installed! For a relatively low cost, you can save yourself from thousands of dollars of repairs that you may need if you hit something. Just because an accessory serves a purpose doesn’t mean that it can’t enhance the way your SUV or truck looks. 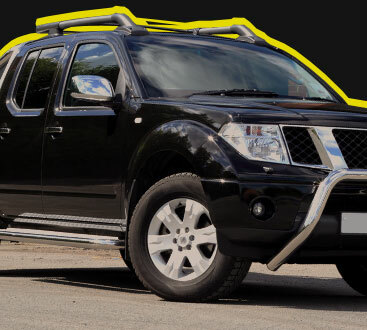 We carry a wide range of bull bars and grille guards that will keep your truck safe and make it look spectacular! No matter what your style, we have something that will match it. Whether you want something that looks strictly utilitarian or you want a grille guard that is a little flashier, chances are good that we have an option that will fit your style perfectly. Over the last decade, we have proudly served the residents of the Jacksonville area by providing the best customer service, affordable prices, and the largest selection of truck accessories. When you want to deal with a shop that understands and cares about you and your truck, we are that shop. No one else will provide you with a free estimate, answer your questions, or treat you as well as we will. Give us a call today to find out how we can make your truck even better by installing high-quality accessories quickly and correctly. Our technicians work fast but they never cut corners, ensuring that you do not have to worry about something falling off or failing to protect you when it is needed most. Contact us at Safari Truck & SUV in Jacksonville today to find out when we can install a grille guard on your SUV! We offer free estimates on all of our truck accessories, including tonneau covers, bed liners, and more!